"A Wrinkle In Time," about three children and three magical beings trying to locate a missing physicist and stop evil from overwhelming the universe, is as dislocated from the current moviegoing moment as its human heroes are from their lives back on earth. It's a gentle fantasy, seemingly pitched at younger children, that would rather take people by the hand than punch them on the shoulder, and that's a good thing; in fact, it's the wellspring of the movie's best qualities. There's a lot here that feels insufficiently shaped or fitfully realized, but at the same time, there's a lot to like. It's the Platonic ideal of a mixed bag. The newness of the new parts counterbalances the ineffectiveness of the stuff that seemingly every fantasy blockbuster does, and that this one doesn't do well. "A Wrinkle in Time" has zero interest in seeming cool, and in its final third, it ramps up the sentiment into a zone that most big-budget movies don't dare enter in the era of irony and "grittiness." 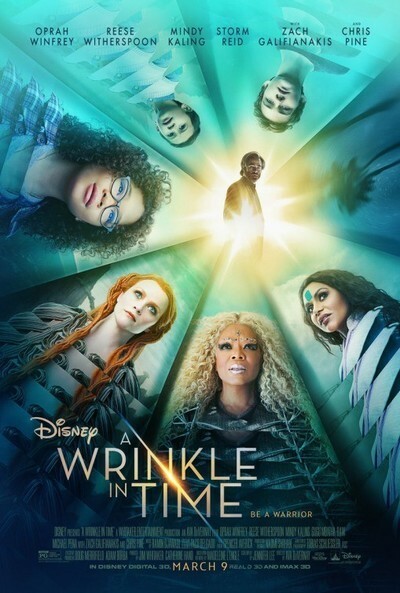 The story begins with Meg Murry (Storm Reid) and her six-year-old adopted brother Charles Wallace (Deric McCabe), and their scientist mother Kate (Gugu Mbatha-Raw) in a state of mourning over the disappearance of the family patriarch, Alex Murry (Chris Pine). The family was baffled by his sudden vanishing, but it turns out to be connected to his research (with Kate) into tesseracts, a phenomenon that allows for the folding of space and time. With help from three magical beings, the goofball Mrs. Whatsit (Reese Witherspoon), the regal Mrs. Which (Oprah Winfrey) and the wise Mrs. Who (Mindy Kaling), the kids leave their world to find Alex, bringing Meg's crush object, Levi Miller's Calvin O'Keefe, along with them. As they travel to a series of galactic locales to free Alex from the grip of dark forces, young Charles Wallace, a prodigy who at times evokes that little kid from "Looper" with the thundercloud eyes, undergoes a terrifying change. The film's tone is so radically earnest at certain points—particularly when it's dealing with loss and disappointment—that the movie's logo could be a gigantic ear of corn. In its multicultural casting, its child-centric story, and its emphasis on the validity of feelings, it's so different from every other recent big-budget live-action fantasy (superhero films included) that its very existence amounts to a contrarian statement. Much of the emotional heavy lifting is done by the daughter-father team of Reid and Pine. Pine has stealthily become one of the most versatile leading men in American movies, and one of the few who can channel that old-fashioned, George-Bailey-having-a-breakdown-at-the-bar brand of emotionally vulnerable masculinity without seeming as if he's just doing a bit. Like the rest of the core cast, he's doing old-movie style, just-plant-your-feet-and-say-the-lines acting that seems to be pretending that the Method never happened. Reid in particular is quite good at this; some of the notes she strikes early on reminded me of Elizabeth Taylor in "National Velvet" in their near-theatricality, but in a scene with Pine near the end, the facade drops, and it's devastating. You think about how strong this girl had to pretend to be, how impervious to pain, and how it was all for show: a survival mechanism. The problem is that the minute the film earns our trust and guides us into the story, what it has to show us isn't all that remarkable: mostly a lot of nondescript glittering/pulsing/stretching/bursting CGI, of the sort that you'd see in a substandard Marvel film (there's even a creature that looks like a flying cabbage leaf). This is made impressive more by the characters' reactions than to anything that's onscreen. It also suffers from trying to do too much in its relatively slight 109-minute running time (the source novel Madeline L'Engle has been considered un-adaptable since its first publication in 1962, so it's possible that even a miniseries might've had issues; the 2003 TV movie was a train wreck). And there are times when director Ava DuVernay ("Selma") and screenwriters Jennifer Lee and Jeff Stockwell have trouble smoothly shifting between the film's various modes, which run the gamut from doomed love story to coming-of-age romance to knockabout comedy to high-minded philosophical odyssey. I wish that DuVernay had given Pine and Mbatha-Raw more scenes. And I wish she'd asked more of Winfrey, who's effortlessly regal but doesn't do much here besides make pronouncements; Kaling, a charming presence who's stuck in a part with dialogue consisting entirely of quotes by great poets and thinkers; and Witherspoon, who's agreeably dotty but never ascends to that Glinda, Good Witch of the North plane she could easily reach were she so inclined. But this is more a matter of wishing the film had done more of what it was doing already than wishing it had done something else. "A Wrinkle in Time" arrives in theaters during the same week that U.S. viewers observed the 50th anniversary of the premiere of "Mister Rogers' Neighborhood," a beloved series that was all about respecting the space, the wishes, and the feelings of others. There are many points in "A Wrinkle in Time" where the characters' journeys suggest a big-budget CGI version of that show's regular excursions into "The Neighborhood of Make-Believe," a world in which kindhearted children and adults have poker-faced conversations about insecurity, loneliness, anger, and other mental states openly, amongst themselves and with sock puppets, then return to the "real" world and watch a musical performance or visit a harmonica factory. In that spirit, Mrs. Whatsit just shows up in the family's house, less like a real-life neighbor than a scatterbrained wood sprite from a Disney Channel cartoon, and the mom is the only character who seems shocked. Mrs. Which is a 40-foot tall shimmering apparition looming over a backyard during her first appearance, and the onlookers seem more intrigued than terrified by her, as if this kind of thing happens a lot. Meg asks her new maybe-beau Calvin to join her in her time-space journey, and he agrees as readily as if she'd asked him to join her on a walk to the local 7-Eleven. It's the kind of movie where you decide to do something and just go do it, and where no questions are off limits because everyone's so thoughtful. I bet Mister Rogers would have enjoyed it. If you laughed derisively at that line, you shouldn't see "A Wrinkle in Time." If it made you smile, go.